New GBCAT is Ready for Download! What’s New in GBCAT v1.2? The greatest news in this version is support for Kenwood TS-590S transceiver. GBCAT support about 95% of all capabilities of this excellent radio, so give it a try! – Fixed bug (TS-2000, button “PWR”): after Power Off/On, Audio and Squelch are initialized again. – Fixed bug (TS-2000): After GSCAN feature turned off, the following buttons unfortunately remained disabled: APO, FSK.R, iT2M, CALL, 2CALL. – Fixed bug (TS-2000): TX and RX frequency labels are at correct position now. – Fixed bug (TS-2000): Sub receiver may stay turned on while GSCAN is activated. Control will be switched to the Main receiver. – Fixed bug (TS-2000): While switching CTRL from Main to Sub and back, Squelch value changes while slider position stays unchanged. 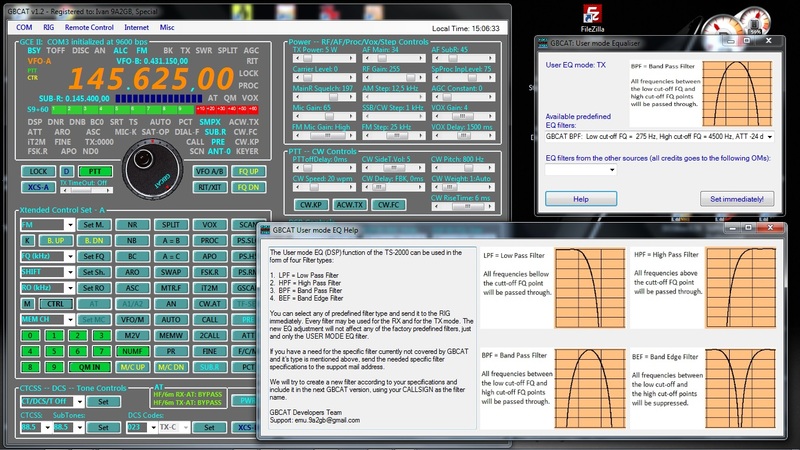 – Fixed bug (TS-2000): Shown TX frequency now includes calculated repeater shift. – Fixed bug (TS-2000): After switching VFO-A/VFO-B, the Power slider for the current Band now shows band power correctly. A few minor bugs are also fixed, as well as a few minor cosmetic changes are applied. Please note that there has been a revision and extension of the GBCAT.CFG configuration file, so the old configuration file can’t be used with the new version of GBCAT. – Improved, optimized, 5x faster GSCAN (TS-2000, TS-590S). – Improved conventional memory operations (TS-2000, TS-590S). – Improved COM2IP Redirector and IP2COM Server. – Added feature (for all supported RIGs): GBCAT Easy Start. – Added feature (TS-2000): Kenwood TS-2000 DTMF Memory Manager (Button DT). – Added feature (TS-2000): User mode Equalization for both RX and TX modes (with installed filters). – Added feature (Kenwood): Signal strength indicator (slightly precise than S-meter, 0-30, step 4db). – Added feature (Kenwood): Memory keying (Button MK). – Added feature (for all supported RIGs): The simple Parrot feature, “P” button (near “PTT” button). File format: PDF, File size: about 2.3 MB.